b5Studio: Large and in charge. You hoped it would - fess up. Big just seems to do the job best. That's why we simply cannot resist them here at the studio. And it would seem you have the same weakness. A large rug just gets the job done with impact! Your warehouse loft will feel that much warmer. Your castles will feel just that much toastier. Your bedrooms will feel that much cozier. So give in to your desires. Don't forget bubbies - there is more rug to come. The week isn't over yet. 13 of you downloaded a file with a duplicate. Please redownload - this will overwrite the package file. Hi,where can I download the bed in the last screen shot? 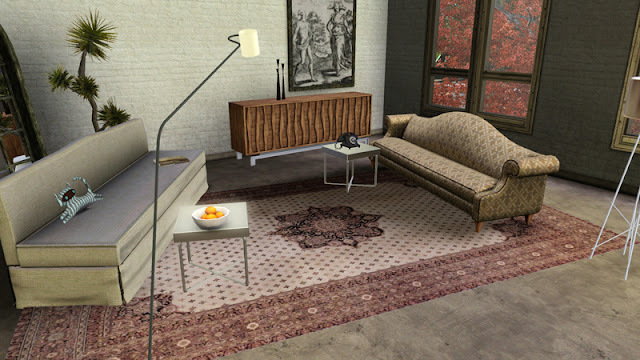 Hi Jvardon - that bed is from Exotic Elements - I posted this later than I expected, found an error in the actual set (a duplicate) and did not get a CC list at the base of the post. It is part of her Moroccan Inspired bedroom. I hope to get the CC list together tonight when I get home from work. Birgitte Heuschkel Thank you for the request - someone posted the same request a bit ago on MS3B and believe it or not I am always trying to find something with different colors. Diversity in pattern and color is usually my first consideration. That said, it's a process to find good original source material. One of my sources even allows you to select by color range and it is surprising that even a 'blue' rug might be a couple of threads of blue with a predominant field of red/orange. Further, if I do find a good image, it needs to be large enough to fill the mesh, clear, and relatively straight on so I am not excessively tugging and torquing to match the template I have created. When pulling from the collected images in my source folder, I am trying to consider scale of pattern for the size I want to create (sometimes a tiny RL rug still looks good huge due to the scale of it's pattern) and ratio to the mesh I want to create (for this one a long rectangular shape - not say, a square that will be altered too greatly). Phew. All that said, there are many factors working against my selections. Where this type of rug is not necessarily CASt-able - I am always trying to find something new or interesting. Oriental rugs do offer some gorgeous patterns and variety, but often the medallion motif can tend to make all of these rugs start to look alike. I am pulling together a traditional set that would be more like French Aristocrat style (whatever that is called) and even those are reds and pinks with subtle shades of other colors. I am keeping my eyes peeled for something new or different. 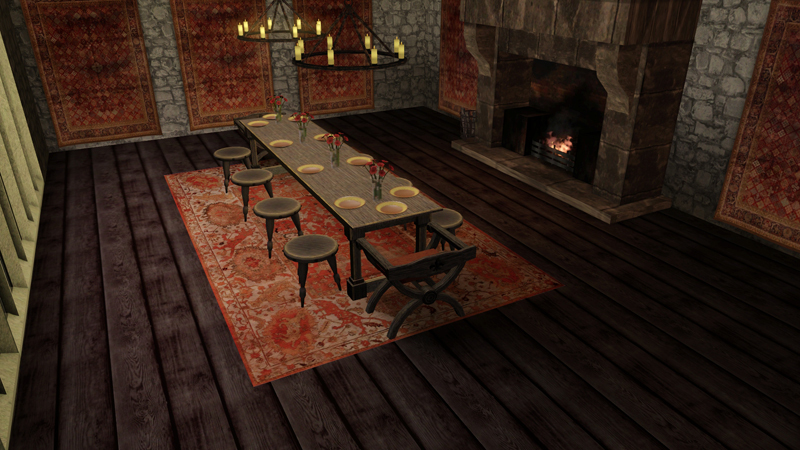 I wanted to do something like antique floor cloths and sadly, I could not locate a good source of material. Rag rugs are also a hard one as when you pull back to look at them, unless they are overdyed, they look like static. I like Big rug. Beautiful. Thank you. Click . . . enlarge.